At Eastec 2019, OMAX® will be presenting the latest in waterjet technology. In terms of types of material cut, an abrasive waterjet is the most versatile cutting method available. On site, OMAX will have a range of machines including the new ProtoMAX®. Stop by May 14th-16th at the East State Exposition, West Springfield, MA, booth 1106, to find what OMAX abrasive waterjet best fits your applications. The ProtoMAX can cut through nearly any material, including aluminum, titanium, stone, carbon fiber, and G10 composite. The compact machine footprint combined with its comprehensive versatility makes the ProtoMAX an ideal abrasive waterjet for prototyping, educational applications, or as a complement to a larger machine shop. The pump and cutting table are on casters for easy relocation. Work material is submerged under water for quiet cutting that won’t disrupt your work space. With the clamshell cover and submerged cutting, ProtoMAX is safe and quiet (approx. 76 db). Though compact, the ProtoMAX delivers 30,000 psi cutting power with a 5 hp pump. 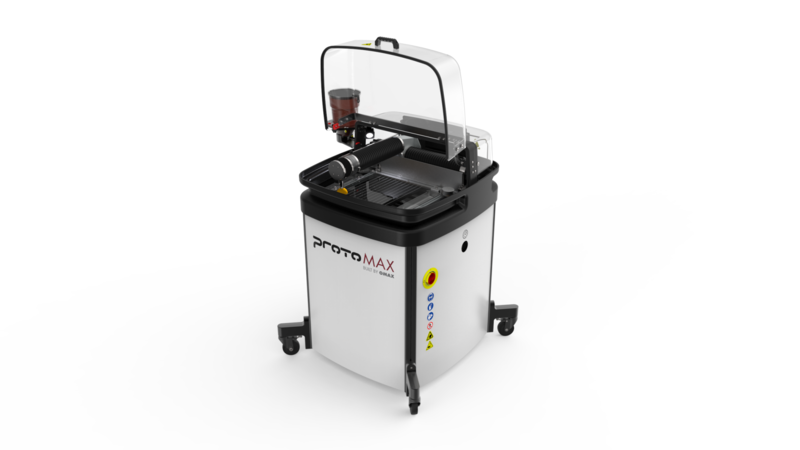 Like all OMAX abrasive waterjets, the ProtoMAX cuts with no heat-affected zone and no change to the material properties. The waterjet plugs into a 240V AC outlet and does not require any hardwiring. While at Eastec, experience OMAX’s easy-to-operate software IntelliMAX®. IntelliMAX was engineered specifically for abrasive waterjets and no special machine code knowledge is required to use it. Online training for machine operation and maintenance is provided free, so customers can access training information whenever they need it and at their own pace. In addition to being easy to use, IntelliMAX software is compatible with more than 90 different file formats, including all major CAD program file types, plus graphics file formats such as jpg, gif, and png files. This means almost any 2D or 3D part file can be imported directly into an OMAX waterjet controller and turned into a real part. Based in Kent, Washington, OMAX Corporation is the leading manufacturer of advanced abrasive waterjet systems. The company designs waterjet systems that feature intuitive software, efficient pump technology, and a wide range of accessories. Over the last 25 years, OMAX Corp. has developed the OMAX, MAXIEM, GlobalMAX, and ProtoMAX brands offering a full spectrum of waterjet machine tool capability. The ISO 9001:2015 certified company designs, manufactures, assembles and tests components as a complete system to ensure optimum performance. OMAX Corp. also has the most comprehensive service and support network in the waterjet industry to keep its customers ahead of the manufacturing curve.